If your property has a creek, river, or lake shoreline, you are a Waterfront Homeowner. Here’s how you can reduce pollution and prevent the spread of invasive species. Rainwater and melting snow wash over the land carrying contaminants such as dirt, oil and toxic auto fluids, pesticides and fertilizer, bacteria from pet waste and failing septic systems and even heat from pavement into the nearest lake, river or stream. The result is excessive aquatic plant growth and algal blooms, decreased water clarity, altered stream flows, degraded habitat, and shoreline erosion. As a waterfront homeowner, you have a special opportunity to help your waterbody stay clean and healthy for both you and your community. You can minimize runoff by planting buffers of trees, shrubs, taller grasses and wildflowers between the shoreline and upland areas to help trap and infiltrate runoff and control erosion.  You can also compost home yard waste and dispose of animal waste, and if you have a septic system get it inspected and maintained every two years. 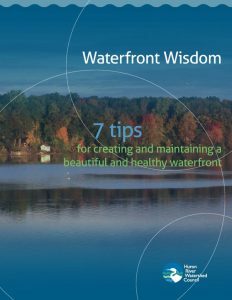 Download “Waterfront Wisdom,” our 12 page pdf booklet. Contact Pam Labadie, plabadie@hrwc.org, if you would like a printed copy mailed to you. 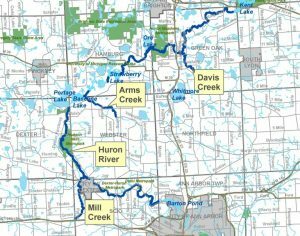 The State of Michigan Natural Rivers Program mandates certain development restrictions that are specific to the Huron River. The Huron River and its tributaries are public domain, and are subject to public trust protection. The 1970 Michigan Natural Rivers Act (Act 231) designated the stretch of river between Kent Lake Dam and Barton Pond (27.5 miles) as “country-scenic river.” This Natural Rivers District includes a protected zone of 400 feet on either side of the natural watermark. In this protected zone, development is strictly limited and the natural vegetation strip has been increased. On private lands within the District, zoning also requires extensive building structure and septic system set-backs on both the river’s main stem and the tributaries. In the Natural Rivers District of the Huron River, no new commercial, industrial, or extractive development is permitted within 300 feet of the river or its tributaries. Michigan Clean Water Corps: The Cooperative Lakes Monitoring Program. CLMP has been an important component of Michigan’s inland lakes monitoring program for over 30 years, which makes it the second oldest volunteer monitoring program for lakes in the country. The program helps citizen volunteers monitor indicators of water quality in their lake and document changes in lake quality over time. Michigan’s Natural Shoreline Partnership. MNSP researches, demonstrates, and develops natural shoreline technologies that benefit lake ecosystems. Their mission is to train contractors and landscape professionals about erosion control, educate property owners about natural shorelines, and encourage local and state policies that promote natural shoreline management. Michigan Lakes and Streams Associations is a non-profit, state-wide organization dedicated to the preservation, protection and wise management of Michigan’s vast treasure of inland lakes and streams. MLSA assists lake, river and stream, and watershed associations as well as individual riparian property owners. Plant and maintain a vegetative buffer of trees, shrubs, taller grasses and wildflowers between the shoreline and upland areas. Shoreline buffers trap runoff before it gets into waterways. As stormwater seeps through the buffer area, the plants filter out pollutants and sediment, reduce and regulate the water flow, and moderate water temperatures. Begin by allowing your shoreline to rebuild itself. Mowing to the water’s edge discourages native plant growth and encourages runoff and erosion. By allowing your shoreline to rest, the dormant seeds of native plant species will take root. For optimum benefits a bigger buffer that is at least 100 feet wide (75 feet of trees, shrubs, taller grasses and wildflowers plus 25 feet of residential lawn upland) from the water’s edge to the first pavement or structure on the property is best. Any buffer helps, so if 100 feet is not an option, work within the size constraints of your property. More than just beautiful, native plants are adapted to local soil conditions and rainfall, thereby reducing the amount of water and time you’ll spend on upkeep. Additionally, their deep roots can help infiltrate runoff, filtering out toxins. Keep it to upland areas or use it to create trails or pathways through your buffer to access your shoreline. Don’t forget native aquatic plants. Their deep root systems help stabilize and clean water while providing food and habitat for aquatic life. Allow these plants to thrive as much as possible by giving them plenty of space free of disturbance. Learn how to identify and remove aquatic invasive plant species without spreading their growth. Often times, invasive plant species are spread by pulling out the plant by hand which makes the situation worse. Root and plant fragments can resettle and spread seeds to other areas. Michigan Native Plant Producers Association is a group of independently owned nurseries that grow and sell Michigan native plants and seeds. Michigan’s Natural Shoreline Partnership provides resources on natural shorelines and landscaping. Find helpful designs, lists of plant species and where to place them, workshops, cost comparisons, professionals, and instructions. Michigan Lakes and Streams Associations provides information and publications to educate homeowners and links, and references on how to manage Michigan’s lakes and streams. Erosion allows sediment filled with unwanted nutrients and pesticides to flow into waterways. With soil erosion, you may notice murky water, reduced oxygen levels for aquatic life, loss of aquatic habitat, sedimentation and loss of valuable waterfront property. Consider one of the following ways to reduce sediment runoff and erosion. Natural shorelines are buffers that include erosion-control fabrics, native vegetation, and rocks at the water’s edge that protect the property from waves and erosion while improving ecological features and the shoreline’s integrity. Natural shorelines are an alternative to engineered structures like seawalls. Natural shorelines offer many benefits. Prevent pesticides and fertilizers from running directly into the water. Prevent flooding or standing water better than turf grass. Cost less than structural seawalls. Can be installed by homeowners and require little or no maintenance once established. Provide an attractive privacy screen while maintaining views of the lake. Absorb wave energy, keeping soils and sands settled and water clear. Can act as a deterrent for Canada geese. Are attractive and environmentally healthy. The go-to resource on all things natural shorelines is the Michigan Natural Shoreline Partnership! At the waterfront, leave as many aquatic plants in place as possible to hold bottom sediments and protect the shoreline from wind and ice action. Prevent disturbed soil from being exposed and vulnerable to erosion through runoff. Plant bare soil as quickly as possible with an appropriate vegetative cover, such as sod or seed. Mulch the area with straw to prevent erosion until the seeds germinate. Incorporate large woody debris, such as stumps, logs and tree trunks to provide essential aquatic habitat and stabilize shorelines. If you are managing woody debris in a stream for recreational passage, experts recommend leaving most logjams in place. Read more in the Woody Debris Management 101 Fact Sheet. If you have an existing structural seawall and are not ready to try a completely natural shoreline, supplement the area on the waterfront side with native aquatic vegetation to help restore lost habitat and on the upland side incorporate a plant buffer. Read more at Plant a Shoreline Buffer. Learn how to identify and remove aquatic invasive plant species without spreading their growth. Often times, aquatic invasive plant species are spread by pulling out the plant by hand which makes the situation worse. Root and plant fragments can resettle and spread seeds to other areas. Know your invasive terrestrial plants species too, and be ready to control them. Native shorelines are particularly vulnerable to seeds coming in on the water. If the land you are changing is either 1 acre or if it is within 500 feet of a lakeshore, wetland, or stream you may need a Soil Erosion and Sedimentation Control Permit. Check with your county. Activities below the ordinary high water mark may require an Inland Lakes and Stream Permit. Check with the Michigan Department of Environmental Quality. Learn about invasive species in the watershed. It’s important to know how to identify and prevent invasive species from spreading. Invasive species are not native to the region and flourish without a natural predator or other means of natural balance. These invasive species spread quickly and exhaust resources used by native species, crowding them out. Aquatic invasive species include plants and animals. Most commonly known are zebra mussels, the sea lamprey, round gobies, eurasion milfoil, phragmites, and the asian carp. In a region like Southeast Michigan with its many lakes and streams, there are lots of opportunities for aquatic invasives to spread. Proper lake and stream management as well as maintenance of boating equipment can help. Most importantly, DO NOT PULL INVASIVE AQUATIC PLANT SPECIES out of infested areas. This can actually help spread the plant’s seeds or its fragments which can root elsewhere. Check the Midwest Invasive Species Information Network (MISIN) for an up-to-date list of invasive species and how to identify them. 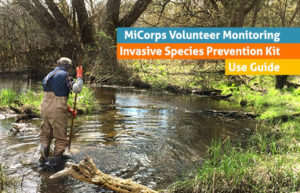 MISIN is a regional effort to develop and provide an early detection and rapid response (EDRR) resource for invasive species (terrestrial and aquatic animals and plants). Their goal is to assist both experts and citizen scientists in the detection and identification of invasive species in support of the successful management of invasive species. Many AQUATIC INVASIVE PLANT SPECIES clog boat propellers, overrun beaches, and compete with native plant life that sustain fish and many aquatic animals. Unfortunately, once an aquatic invasive plant has spread, it can be nearly impossible to remove it. Early detection and rapid response is the best method! Keep watch with the Michigan Invasive Plant Network’s (MIPN) Keep A Lookout Flyer for new invasive plants in the Midwest. MIPN is a deep resource for aquatic and terrestrial plant information, providing resources for identifying, preventing, control and management of aquatic and terrestrial invasive plants. MIPN is also a member of the Great Lakes Early Detection Network, which has a web-based reporting tool. If you have an eye for spotting aquatic invasive plants, consider becoming a Cooperative Lakes Monitoring Program (CLMP) Volunteer. Many varieties of carp, mollusks, and even the goldfish are listed as invasive species. These animals can compete with native populations by spreading disease, or consuming native habitats, food sources, or the species itself. It is important to remember to not release animals into a different habitat. Introduction of non-native plants into our landscape has been both accidental and deliberate. If a non-native plant grows aggressively, it is considered “invasive” and can have devastating effects on other plant populations. Purple loosestrife, for example, was introduced from Europe in the 1800′s in ship ballast and as a medicinal herb and ornamental plant. It quickly spread and is now crowding out the native species that provide food for aquatic creatures in 42 states. Examples of invasive species in Southeast Michigan include: Norway maple (acer plantanoides), Autumn Olive (Eleagnus umbellata), Buckthorn (Rhamnus cathartica, Rhamnus frangula), Privet (Ligustrum vulare) and Honeysuckle (Lonicera japonica, Lonicera maackii, Lonicera tatarica). Natural Area Preservation Division of the Ann Arbor Parks and Recreation Department. Has detailed information on invasive plant species, including lists, fact sheets and links to reliable invasive plant data and tips for preventing and controlling their spread. Boats and trailers, canoes, kayaks and other water sports equipment can transport pollutants and invasive species into our lakes and streams. Check out our video and free downloadable how to kit! Practicing routine cleanings can help prevent spreading unwanted substances from our lakes and streams whether its oil, invasive species, or other pollutants. Rinse, drain, and dry your boats, trailers, canoes, kayaks and anything else that will be used in another body of water AFTER EACH USE. Clean them on the grass or at a car wash that will keep the runoff from draining into a waterbody. Find cleaners that are phosphorus free and not solvent-based (baking soda, borax, lemon or lime juice). Carefully dispose of waste such as oil at approved sites and do not dump it into a stormdrain. Check for leaks and spills so that runoff doesn’t carry any contaminants into the watershed. Boats, vehicles, dogs, fishing and sporting equipment, bait buckets and anything else that comes into contact with water should be thoroughly cleaned and dried before entering a different waterbody. DO NOT release fish, plants, or animals into bodies of water that they did not come from. Before bringing your watercraft or other water sports equipment into another body of water, ensure that bilges, live wells, the hull, propellers, and trailer are completely free of water, mud and plants. Additionally, toss unwanted bait into the trash and not the water. Clean Boats Clean Waters is a cooperative program of Michigan Lake and Stream Associations and MSU Extension, training volunteers across Michigan to conduct boater education and boat/trailer inspections at boat launches to reduce the spread of invasive species.